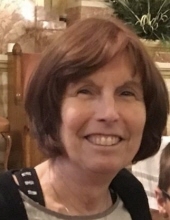 Diane M. Herbert, 67, of Hillsborough, New Jersey passed away peacefully at home surrounded by family on February 8, 2019. Mrs. Herbert, a children's librarian, retired from the Hillsborough Public Library after 25 years and created hundreds of literacy and educational programs during her tenure. She was an avid reader and loved to travel, but her greatest joy in life was her children and grandchildren. She was preceded in death by her husband, Alan Herbert, her father, Frank Christoph and her mother, Margaret Christoph. Diane is survived by her children: daughters Pam and her husband Jim, Melissa and her husband Rob, and her son Jeffrey; as well as her grandchildren: John, Matthew and Luke; and her siblings including: Paula, Ross and Neal. Donations in lieu of flowers may be made to the American Cancer Society's Hope Lodge, 132 W 32nd St., New York, NY 10001. To send flowers or a remembrance gift to the family of Diane Marilynn Herbert, please visit our Tribute Store. "Email Address" would like to share the life celebration of Diane Marilynn Herbert. Click on the "link" to go to share a favorite memory or leave a condolence message for the family.